Discussion in 'Movie Forum' started by leamspaceman, Jan 7, 2017. I just finished watching 'Under The Shadow' and was once more let down by a potentially scary film that didn't do anything at all to frighten me. I seem to have developed an immunity to scary films but there must be some movies out there I've yet to see that will satisfy my need to be terrified. So... can anybody recommend a properly scary movie? I'm a big fan of psychological horror and enjoy something creepy that gets under my skin rather than something that goes down the 'jump scares' route. The only movie of late that got to me was 'It Follows.' I found that intensely creepy and extremely unsettling... right up my street. Watched UTS the other day too. Decent movie but far from scary/unsettling. Not many movies really get to me. Only ones that still freak me out a tad still are Alien/The Descent. Scary rather thsn unsettling. Paranormal Activity freaked me out several years back. Martyrs (French) was a bit unsettling. Sinister was pretty decent, not so much the second. Enjoy the sound stage which helped building suspense. But try get a copy of martyrs, won't regret it. Last Shift which can be found on Sky Cinema is worth a watch if you like creepy. The original Martyrs, as mentioned above, is a must see. May have aged now, but I recall Switchblade romance / Haute Tension being one of the scarier films I'd watched. Eden Lake - freaks me out just typing it! Yes... I've seen 'Martyrs'... both the original and the remake. I'm not sure I've seen' The Last Shift' so will give that a shot. Also not seen 'Switchblade Romance' or 'Eden Lake' so might track those down. Bit leftfield here but "Threads" could be classed as pretty disturbing. If Nukes are your thing. Granted, it looks very dated but it is, bar non, the bleakest film i've ever seen. Found these newer titles very enjoyable and creepy... Baskin, The Eyes of My Mother,The Autopsy of Jane Doe and Train To Busan for a fun but very melodramatic ride. Remember seeing 'Threads' when it was originally broadcast on BBC. I had the VHS of it for years. Autopsy of Jane Doe and train to busan, both great films. Now I'm gonna have one more drinky poo Randy. Sinister and The Conjuring are pretty good recent efforts. Samsung UE60KS7000, Samsung UBD-K8500, Denon AVR-X4200W, Benq W1070, Sapphire 106" Electric Screen. 5.1.2 Atmos/DTS:X : Monitor Audio BX2 fronts, BX centre, BXFX rears, BXW10 sub + M.A. Pro-IC65 ceiling. I found Dark water (the original Japanese version) quite unsettling with a dark foreboding. Add REC to the 'May have aged now' group. Audition , I'm no Japanese horror fan but I find this little gem very disturbing. It takes its time to get going but I expect that is what makes the impact so shockingly disturbing as it's so unexpected. Don't bother with main stream Hollywood horror, it's tripe, unless loud noises terrify you of course. I just watched 'The Last Shift' based on your recommendation. Enjoyed it and yes, it is pretty creepy. Loved the surround effects... lots of creaking flesh and bone sounds in the rears. Still didn't give me chills though. I guess I've seen too many films of this type in my 47 years that I've become almost completely desensitized? What I did enjoy was the ending that didn't go for a happy conclusion. I liked the fact that she didn't make it to the end of the shift and finally succumbed to the evil. Glad you enjoyed it at least. Not many new decent horrors about sadly and I think you're right about becoming desensitized to it all. Have to laugh when every new trailer says "scariest film you'll see this year" . The Taking is another half decent effort I found on Sky but that's compared to most of the other rubbish on there. One of my favourite films that I saw last year was Circle. Psychological horror along the lines of Cube. Don't read more than the brief synopsis going in. The 2014 remake of "Annie"
Seen it... I think this was the film that finally desensitized me.........! As a bit of an aside. Like the OP I have become pretty much immune to scary films but I saw something recently that really freaked me out and made my skin crawl. 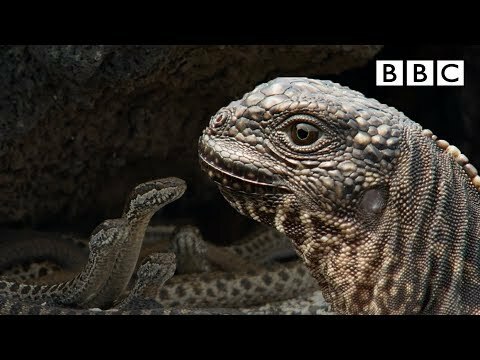 It was on Planet Earth II, about igaunas being hunted by racer snakes on the Galapagos Islands. This is just an excerpt of the footage there was quite a bit more. Not heard of Martyrs myself so googled it and have added the 2008 version to my watchlist. But whilst googling, I spotted this, may be of some interest, I am going to give it a read through. If its psychological you're after then I'd go with The Babadook, The Orphanage, The Conjuring, and perhaps The Witch (which admittedly isn't 'scary' but is unnerving imo). Probably plenty in the Horror Film thread, but definitely check out J-Horror for decent non-slasher scares. You can't go wrong with Ju-on (The Grudge), not the US remake, for example. Some great suggestions above but I also feel that films just don't scare me any more. The original Thai "The Eye" from 2002 had a couple of moments that really put the wind up me. Genuine shiver up the spine. Night of the Demon and The Haunting. Session 9 was a good one of I remember correctly. I watched 'Session 9' this afternoon. Very good movie. Didn't scare me as such, but still a very taught and tense view. As the movie unravelled I was taken in by what I felt was a collective paranoia that took hold of the men... due to environment, personal and interpersonal relationships and sheer pressure. However, by the end of the movie I wasn't really sure what had transpired? It left me thinking and I like that in a movie. Great use of music and sound too. Lots of backwards tape loops and the like. Thanks for bringing my attention to this great film. Very unsettling and actually quite unique and original whilst also using some cliches of the genre to good effect. Posted By mints In What Is The Best TV For You?